Ever think you would get a history lesson from Rambo? Clues to our nation’s history emerge from the unlikeliest of places, and in recent decades, historians have come to look to films for insight into the social, cultural, and political realities of the past. Cinema is among the most powerful vehicles for expressing ideological or sociopolitical commentary, and a well-made film can have a visceral and long-lasting resonance on its viewers, shaping opinions in a forceful way. D.W. Griffith, the director of one of Hollywood’s first epic historical films—Birth of a Nation (1915)—once predicted that movies, as “the newest and most powerful form of dramatic expression” would eventually be the source of most people’s historical knowledge. After viewing Griffith’s epic, President Woodrow Wilson reportedly remarked that the film was like “writing history with lightning.” For better or worse, many people’s perceptions of historical events and time periods are shaped by the movies they watch, and society’s view of the past and present can be powerfully affected by film. Historical films—whether their subject matter be ancient Rome, the Middle Ages or World War II—can be an especially fruitful area of study for historians, not only for information on the eras depicted but for clues into the era in which they were produced. This historical interpretation of films pays particular attention to “presentism,” defined as using a depiction of the past to comment on the present. One of the most oft-cited examples of cinematic presentism is Stanley Kubrick’s 1960 film Spartacus. When Hollywood was suspected of straying from the official line during the Cold War, actors, directors and screenwriters were among the primary targets of the communist witch hunt led by the House of Un-American Activities Committees and, separately, by Senator Joseph McCarthy. Screenwriter Dalton Trumbo, who had been blacklisted from working in Hollywood because of suspected communist affiliations, wrote Spartacus, the story of a slave uprising in ancient Rome. If the employment of Trumbo wasn’t enough to protest the communist witch hunt of the day, the climactic scene of the movie presents dozens of slaves claiming to be Spartacus (the famous “I am Spartacus” line) was an expression of solidarity with their rebellious leader. Viewers at the time and historians since have interpreted the scene as a criticism of McCarthyism and a plea for solidarity against persecution. 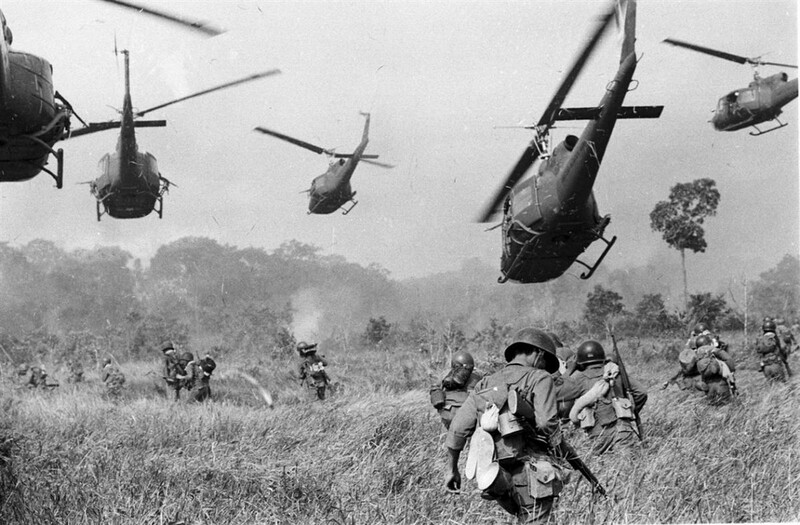 Unlike the Hollywood Western or World War II film, which often followed set tropes of heroes, sunsets, celebrations of brotherhood and uncomplicated plots of good versus evil, the cinematic treatment of Vietnam—perhaps the most traumatic and contested historical memory in the recent American story—has been a much more complex, diverse and anxiety-ridden endeavor. A look at the history of the production of and reception to Vietnam films reveals how the nation processed a military trauma. The roots of the Vietnam War lie in World War II, when Japan occupied the small southeastern country as part of an aggressive campaign of territorial expansion, displacing the colonial French authority that had ruled the region since the late nineteenth century. A communist national independence movement called the Viet Minh, led by Vietnamese revolutionary Ho Chi Minh, challenged Japanese occupation. After Japan admitted defeat at the end of World War II in 1945 and France reoccupied the region, the Viet Minh continued its campaign against French colonialists, capturing the city of Hanoi and declaring Vietnam an independent country. The French, refusing to recognize independence, fought against Ho Chi Minh’s forces until 1954, when the warring parties agreed to a peace settlement dividing the country into two: a communist North Vietnam under the rule of Ho Chi Minh, and a South Vietnam led by a French-backed emperor. The U.S., which had supported French forces financially and through very limited covert military assistance, worried that all of Vietnam would fall under communist rule, a turn of events which under the “domino theory”—a concept first advanced by President Dwight Eisenhower—which posited that surrounding countries would follow Vietnam’s lead by falling to communism and Soviet influence. In 1962, President John F. Kennedy sent military “advisors” to South Vietnam; the conflict continued to escalate over the next few years as subsequent presidents sent more and more forces into the country. Unused to guerilla tactics, American troops struggled to gain leverage over communist forces who were not easily identifiable, and at times hid among the very villagers the U.S. was supposedly liberating. The result was a confused, chaotic war marked by transient victories and ever-rising body counts. Over the course of the war, 2.6 million American forces served in Vietnam, of which 58,000 were killed and more than 300,000 were wounded. As the war escalated, a large and visible antiwar movement developed in the U.S. as public opinion divided bitterly over the conflict. During the war itself, Hollywood largely shied away from producing films that directly addressed Vietnam. Films preceding and during the first years of U.S. involvement in Vietnam (like China Gate in 1957), framed the conflict as an opportunity for American underdogs to defeat evil communists. In 1965, the Pentagon produced Why Vietnam?, which, in the tradition of similar film series produced during World War II, explained the conflict to the public through fairly simplistic pro-military propaganda. Why Vietnam?framed the war as a defensive one, protecting U.S. interests and liberating oppressed Vietnamese from aggressive communists. While Why Vietnam? attempted to package the war in patriotism, more critical documentary makers released films like Inside North Vietnam (1968) and Hearts and Minds (1974), which portrayed the human cost of the war. Furthermore, for the first time in history, television viewers could see snippets of the war on the evening news, alongside images of massive peace protests which grew to include hundreds of thousands of protestors as the war escalated throughout the 1960s. The only fictional film released during the war was John Wayne’s The Green Berets (1968), a film loosely based on a bestselling novel of the same title. Produced with financial assistance from the Pentagon, the film achieved commercial success, but was recognized by more skeptical viewers as blatant pro-war propaganda which celebrated U.S. soldiers as uncomplicated heroes making sacrifices for an unquestionably noble cause. Green Berets also borrowed heavily from the cinematographic tropes of World War II films, applying them to a conflict that was arguably far more morally ambiguous and complex. During World War II, the U.S. government had enlisted Hollywood in the war effort, and movie studios cranked out films portraying American soldiers as brave and willing footmen in a relatively uncomplicated battle against good and evil and freedom and fascism. But the well-recognized and comfortable plots and characters of the World War II film seemed no longer to apply. The divisiveness and occasional absurdity of Vietnam called for a more complex cinematic treatment. It was fitting that two World War II films released during the Vietnam War—Catch 22 (based on Joseph Heller’s darkly satirical novel of the same name) and Slaughterhouse 5 (based on Kurt Vonnegut’s similarly dark science fiction work)—viewed the conflict through a far more cynical and absurdist lenses than had previous cinematic treatments of World War II. Vietnam veterans failed to receive the celebration, parades and respect veterans of previous conflicts returned home to, and at times even faced contempt and violence from factions of society that viewed the war as nothing less than a bloody exercise in imperialism. On top of a lukewarm homecoming, the depiction of Vietnam veterans in films like The Taxi Driver (1976) or Rolling Thunder (1977) often portrayed them as disillusioned, socially marginalized, sometimes insane and criminal, hardened men. The films of this era drew on stock images of the war—pictures of Huey helicopters and jungles that would be immediate recognized by viewers who had followed the conflict on the evening news—and strove toward realism. Yet film, though among the potentially most viscerally powerful conveyors of the history, often fails to explain the larger, impersonal contexts of an event, in this case the economic, political and ideological changes which shaped U.S. involvement in Vietnam. Instead, highly-anticipated Vietnam films like Coming Home (1978), The Deer Hunter (1978) and Apocalypse Now (1979) personalized Vietnam, following one or a few’ characters personal journeys in and after Vietnam. Apocalypse Now depicted the absurdity of war through characters like Officer Kilgore, who bombs a hamlet so that his soldiers can surf. By flooding Apocaplyse Now with ample literary allusions (most notably to Joseph Conrad’s Heart of Darkness), director Francis Ford Coppola shaped the film more around the philosophical battle between good and evil within every man than the war itself, universalizing Vietnam into an existential statement. In perhaps another consequence of “personalizing” Vietnam, films like Apocalypse Now or Deerhunter have also been accused of ethnocentrism, failing to depict the experience, point of view or ideology of the Vietnamese except in vague orientalist stereotypes or as foils for the Western values of the cinematic American heroes. More than one critic has noted the similarity between Vietnam films’ portrayal of the Vietnamese and Westerns’ depiction of Indians or World War II film portrayal of the Japanese enemy. The viewer learns little of Vietnam’s history or society, a cultural myopia that some have argued mirrors the narrow-mindedness that drove the U.S. into the war. The depiction of the Vietnamese would gain little depth in the Vietnam films of the 1980s. In the 1980s, a new breed of Vietnam film emerged, one which historians and film scholars have intimately associated with the conservatism, militarism and military interventionist rhetoric of the Ronald Reagan presidency (1981-1989). Under Reagan, who once referred to Vietnam as a “noble crusade,” the Cold War escalated as the U.S. pursued an aggressive military buildup and more defiantly denounced the Soviet Union. The U.S. military again intervened in developing countries in the regions of Central America and the Middle East under the guise of liberating territories from communism. Films like Rambo and Missing in Action are, unlike the sober meditations on war of predecessors Deer Hunter or Coming Home, escapist, fast moving and dependent on action. Both Rambo: First Blood Part II and Missing in Action center on the idea that American POW’s were still left behind in Vietnam and could only be rescued by renegade super warriors. As many scholars have since pointed out, not only does such a conceit create a plot where an American has a second chance to “win” the war, but it reverses the actual circumstances of the war by portraying the American soldier as the underdog, as the guerrilla warrior against a larger, better-equipped Vietnamese army. In these films, the Vietnam veteran has been reshaped as a pro-war conservative killing machine hero, a presentation some veterans resented and protested by demonstrating outside theaters showing Rambo and selling miniature body bags outside stores hawking Rambo dolls. The one major caveat to this was Robin William’s 1987 film Good Morning Vietnam which integrated comedy into the portrayal of Vietnam. But do Rambo and other films really sell an ideology, or are they just a couple of hours of entertainment put together by a movie studio trying to turn a profit? How can film critics, historians or the average viewer really tell what a film is trying to say? Being able to recognize the tools filmmakers use to depict a point of view in a film is a valuable skill for any historian. There are several methods of cinematic analysis, including authorial intent, reception analysis and content analysis. The phrase “authorial intent,” borrowed from literary theory, refers to what the creator of a work of art meant to convey with his or her creation. In the case of films, discerning authorial intent can be very complex given the number of people involved in the production process. At any given point, the end product can be shaped by the screenwriter, producer, director, cinematographer, sound engineer, actor or even the prop and costume designers. Even documentaries, which at first glance may seem to be the most truthful depictions of what actually happened, are highly manipulated products. Through editing and selective silencing, documentary makers can construe and manipulate their text as much as makers of fiction films. The historian’s job is to research the production process and the point of view of those involved in the making of the film to discern clues to authorial intent. The reception to films touching on Vietnam, a particularly divisive moment in American history, can be particularly telling. Movies like The Deer Hunter inspired fervent fans and derisive critics, with some lauding the film as majestic tribute to the American spirit, while others condemned it as racist, jingoistic and even fascist. In part inspiring the passionate, heated and diverse reactions to various Vietnam films was the fear that they would help shape the historical memory of the war for subsequent generations. When Rambo hit theaters, the Los Angeles Times worried that the film would “double as a history text” for viewers too young to have lived through the actual war. By wading through film reviews, newspaper articles and box office numbers, historians can gauge the public’s response to various films and through that response perhaps gain insight to the social and political leanings of the time period. Despite this, the release of cinematic treatments of Vietnam in the years after the war ended were highly anticipated and sensitively received cultural events, resurrecting the clash of ideologies that had shaped the war and antiwar movement. The varying reception to those films has been a testament to the continuing divisiveness of Vietnam’s legacies and the variety of viewpoints and ideologies that have shaped contrasting memorials of the war. Today, historians and students can see in the cinematic text of the films themselves and the public’s varying reaction to those films a nation still shouldering some contrition, some regret and more than anything, still looking for catharsis. Crystal Galyean majored in history and journalism at Northwestern University before earning her MA in history at Rutgers University, where she was a Master Scholarship Award winner. She works in educational publishing and is especially interested in cultural history and finding new, engaging ways of telling historical stories. Michael Anderegg, “Hollywood and Vietnam: John Wayne and Jane Fonda as Discourse,” Inventing Vietnam, ed. Michael Anderegg. Philadelphia: Temple University Press, 1991, 3. Crystal N. Galyean is a writer, editor, and historian who lives in New Jersey, where she makes sweet sweet bluegrass music with her band the Great Grassby. Her writing has appeared in various educational publications as well as the Village Voice, McSweeney's Internet Tendency, and literary journals.